One quick post before I head out of town for the rest of the week...I'll be back blogging next Monday. For today a sunny, orange California Poppy. In Northern California these bloomed mid-March. 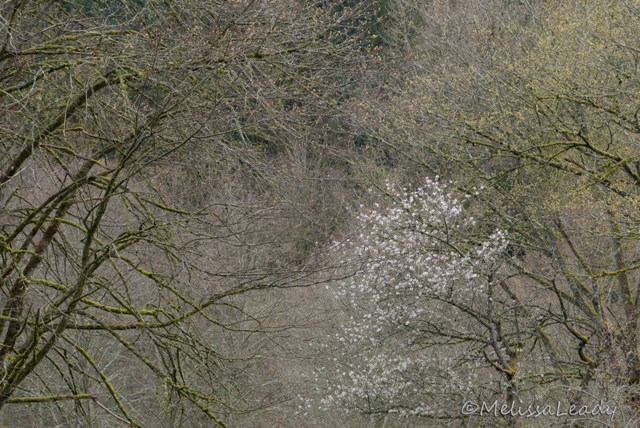 Today I was in the Columbia River Gorge, and they were blooming all along the roadside. Hope everyone has a great weekend! Portland's Steel Bridge, with its towers reflected here in the still waters of the Willamette on a foggy morning, brings an industrial majesty to this wonderful city of bridges. 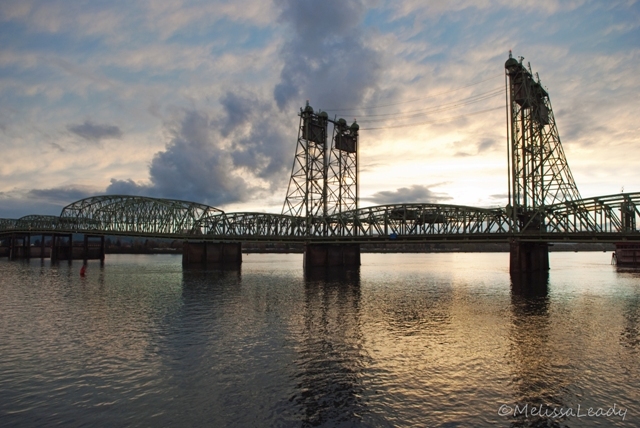 The Steel Bridge is one of eight bridges connecting the east and west sides of downtown Portland, aptly nicknamed Bridgetown. 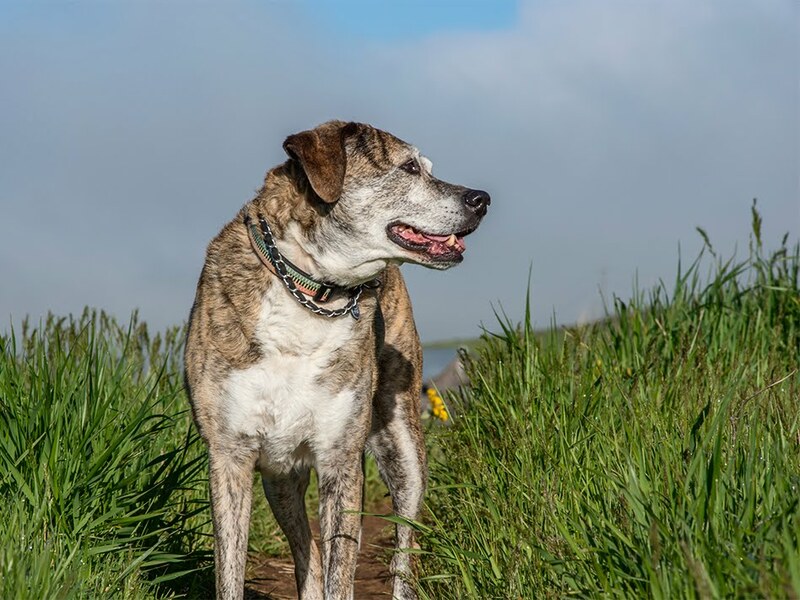 Linking to Weekend Reflection and Skywatch Friday. 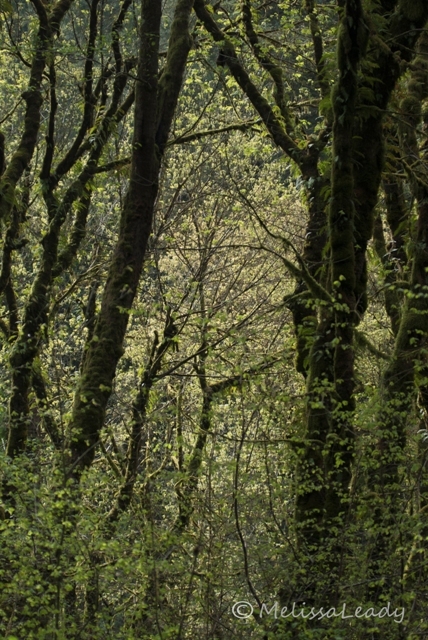 Quite a change of pace today in color and mood, but this forest is actually at the edge of the camas field at Lacamas Regional Park, so technically it's still part of my camas field trip. Lacamas is a fairly diverse park; at the lower elevation the hike winds around a lake and through a cedar forest. It's mossy throughout the park. I love all the different mosses on these trees. This photo was taken on my first trip to the camas field, and there was still a slight fog in the air, which is what gives the enchanted feel to these trees. Well, I made it back to the camas field this morning for a third time this season. I tried to go yesterday, got all the way to the park, headed out on the trail, turned on my camera, and realized that the new battery I loaded was not charged. An unfortunate breakdown in my system. So I headed home and got my batteries charged for this morning. The field has aged noticeably in two days, so if I get a strong urge to visit one more time this season, it will have to be in the next day or two, and given that our forecast turns to rain tomorrow I think today's visit was probably my last for the season. Sigh. I haven't even looked through all my photos yet, so I expect I'll post a few more in this study. (Sorry if anyone is tiring of it, but this series of photos has represented some growth for me, and I'm interested in working though that a bit more. Plus I'm super infatuated with the flowers if you haven't noticed!) Today's shot is actually the last one I took. I was heading down the hill to leave and kept stopping and photographing as I went. I'm glad I made the stop for this flower, because this was just the balance of focus and not-focus that I was looking for today. Plus I think the color is pretty in its richness. This morning I headed back to the blue camas field at Lacamas Park in the aptly named town of Camas, Washington. I only took my 80-200 lens, with the goal of taking a super isolating closeup of a camas blossom, done in the style of my photography icon, Jim Brandenburg. Feeling pretty good about this one. I'm starting to get the hang of this kind of photography, and I actually think I'll head back there one more time tomorrow morning to try out a few other ideas I have. The field is absolutely magical early in the morning. It's a common theme with the other sunrise folks, runners, hikers. We are all so awestruck by the overwhelming beauty of these flowers that you have to stop and share it with anyone you happen to meet, so I end up having a lot of conversations with the other early risers as we marvel at these beautiful flowers. A grassier location at the camas field. And a little bit harsher light too. I wasn't able to get back to the field today, but I'm planning a trip out there for tomorrow morning. Our sunny weather looks like it will hold through the weekend and into next week. 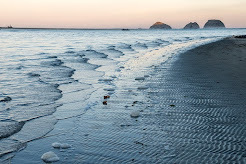 When I started 45journal I was really inspired by the photography of Jim Brandenburg. I spent my first year on the blog trying to copy all his photos, and sometimes I still try to capture his style. I wasn't thinking about his prairie wildflower photos when I was at the camas field, but once I saw this shot on the computer I felt that it most closely resembled his style which includes a very narrow depth of focus. Of course I quickly looked up some of his wildflower photos, and realized I still fall short. Looking at his amazing photography makes me want to head back to Camas again on Friday morning with his narrow depth of field in mind. If you're interested in viewing his work, search Jim Brandenburg prairie smoke or JimBrandenburg prairie coneflowers for two really great examples. As the title name implies, I'm probably going to post a series of photos from my trip to the camas field in Lacamas Regional Park. Camas is a perennial flower in the Pacific Northwest. Related to the asparagus, it has a sweet inulin-rich bulb that was a staple food for Native American tribes. I've got a lot of photos from this dewy early morning visit. Maybe they will all look the same to me tomorrow, but right now I'm imagining I will want to post several, as I decide what I like and don't like about each shot. In this photo I like the addition of the pink clover, and also the diagonal line created by the clover-rich foreground. Happy 5th Anniversary, 45journal! Hard to believe that my one year project, began in 2010, is entering its sixth year today. If you asked me when I started this blog, if I'd still be posting photos in 2015, I wouldn't have even considered it. I had no idea blogging was going to be so much fun; that I was going to meet so many interesting people, from so many different regions and countries; that blogging would be such a motivating tool for practicing my photography. I've been interested in the idea of motivation lately, and in several of the books I've read (Drive by Daniel Pink and Talent is Overrated by Geoff Colvin) they discuss the theory that it takes 10 years of consistent, hard work to master a domain. If that's true, then maybe I'm half way there. Will I still be blogging in 2020? I sure hope so! Also from my hike through the horse trail woods. 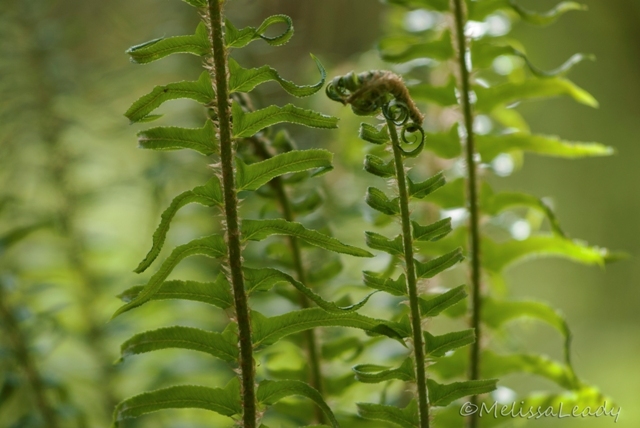 I love seeing all the new fern fronds open. The ferns in these woods don't open in the most symmetrical of ways, which is too bad. The unroll more like a broken party horn at a child's birthday party. Genetically, this lopsided fern is very dominant at the horse trails, and by the time I get to hike on another trail the new fern leaves will probably be open...so I'm filing this photo away to try again next year. Definitely in the eye of the beholder. 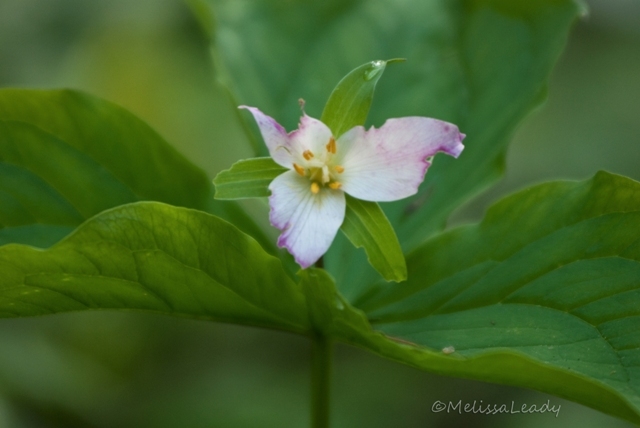 It was the light that drew me to this trillium flower. Of all the trillium blooming at the horse trails right now, this one was in the best light. I have to say though that once it caught my eye, I was captivated by its imperfections. 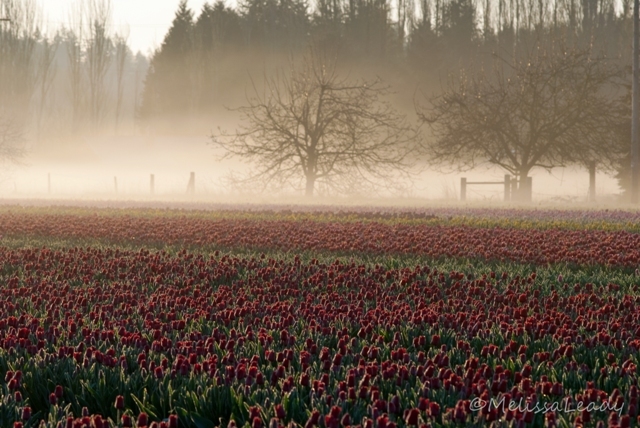 One thing about heading out to the Skagit Valley tulip fields at sunrise is that I shared the fields with the agricultural workers. They weren't picking the fields clean though. They would walk down a row and carefully select flowers for bouquets. However I did see several fields picked clean like this, and wish I could relay the reason for it. I do know that these farms dig up and replant these bulbs each year. Maybe clearing the flowers at once helps speed the bulbs to their resting phase? I needed a change of pace from all the super colorful tulips and daffodils, so I'm posting another photo from my trip up north. A stop in my old stomping ground, Issaquah, just east of Seattle. They are a few weeks behind us in terms of spring leafing out and blossoming. And in fact, I've been meaning to get out to the horse trails to see if I can catch some early spring woods scenes, but have put it off all week. So I'm glad I at least stopped for a few minutes in Issaquah to capture these very early moments of spring in the woods. So tranquil and quiet compared to the tulip fields. The inverse of the Yellow Brick Road. 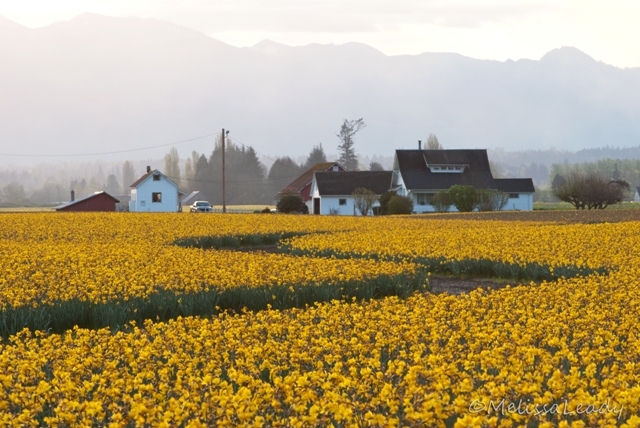 The daffodils were past their prime when I visited the Skagit Valley last week, but that didn't make the fields any less luminous. Can you imagine if this were your driveway? I would definitely walk to get the mail! 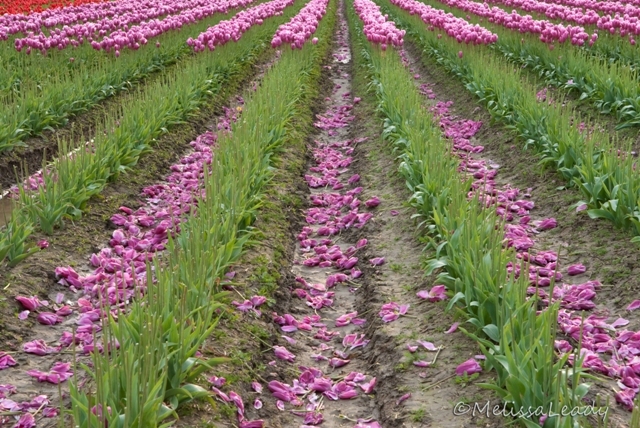 I found this smaller tulip field in Skagit Valley much more accessible than some of the larger fields where they charge admission to enter or park. Here I could pull up along the roadside and photograph to my heart's content. I photographed on the evening of the 2nd and the morning of the 3rd. This photo is from the morning shoot. From a photography standpoint, one thing I became aware of during my artistic photography class is my tendency for a very static horizontal composition, which I've gone to here out of habit. The thing is, I do find myself liking this type of composition. I guess I was trying to highlight the stripes of color bands, including the foothills in the distance. I'd be curious for feedback on this though, as the week goes on. I think this might be my only horizontally composed image. 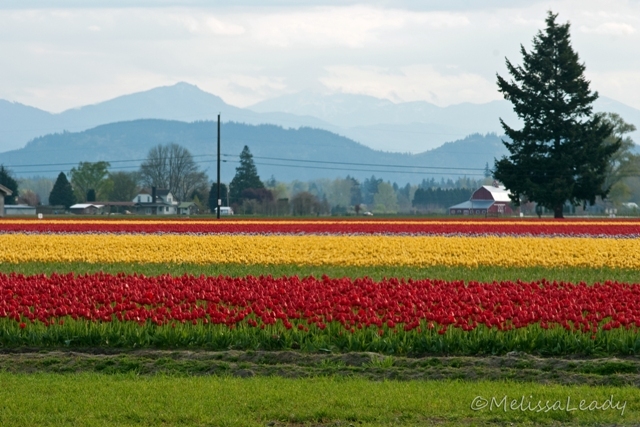 I was up in Seattle over the weekend, which gave me the opportunity to visit the largest tulip farming region in the Pacific Northwest, the Skagit Valley. 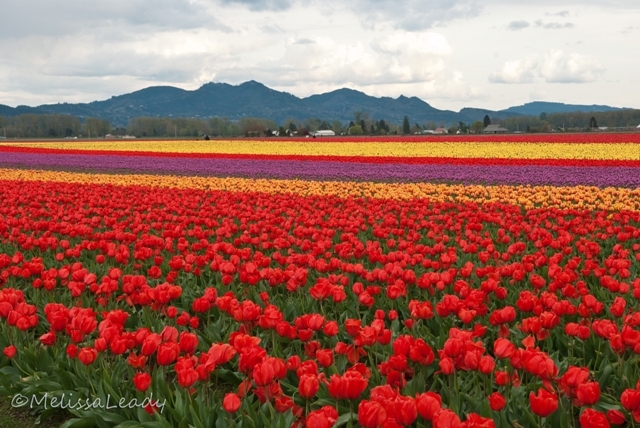 The tulip farms center around the towns of LaConner and Mount Vernon, about an hour's drive north of Seattle. I had a short visit here last year in bad weather and my memory was that the tulip color in this area was especially vibrant. I felt that way again on this trip. The colors seemed almost unnaturally vivid. 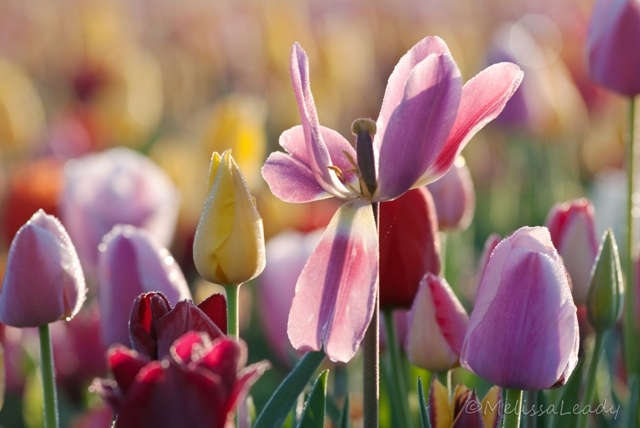 Be prepared for at least a week's worth of tulip photos! The drive to the tulip farm in Woodland, Washington takes me along the banks of the Lewis River, and so far at least, the river is reflectively calm in the early morning. Of course I can't help but stop and photograph, and on this morning I wasn't the only one who thought the view was photo worthy. 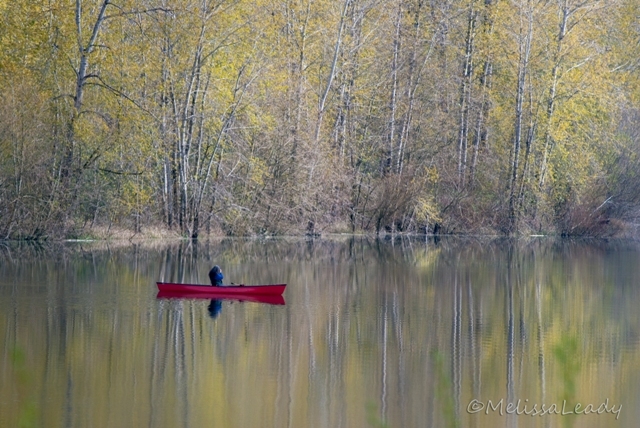 This canoer was also inspired and momentarily stopped her paddling to capture the early spring scene. Another view of the back field at Holland America Bulb Farm in Woodland, Washington. The front fields include a self pick area and viewing field with labeled rows of each variety grown and sold here. The back field is larger with thicker bands of color and tulip variety. Just before the fence line in this photo is a thin strip of yellow and pick tulips, which I know is barely visible in this bright fog. This photo was taken after sunrise, and it really taxes the abilities of my camera to render extreme light. Too bad I didn't notice the fence before the sun rose!